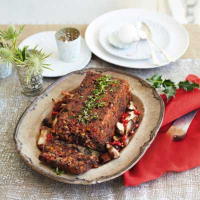 This delicious, vegetarian nut roast makes a brilliant meat-free main course for Christmas Dinner, or other special meals. 1. Preheat the oven to 180ºC, gas mark 4. Grease and line a 1kg loaf tin with baking parchment. Arrange the mixed nuts over a baking tray and roast for 8-10 minutes until golden. Tip onto a chopping board and allow to cool, then coarsely chop. 2. Meanwhile, heat the olive oil in a large sauté pan and gently fry the soffritto mix with the garlic for 4-5 minutes, until softened. Tip in the chopped nuts with the thyme leaves and season generously. Stir in the spinach leaves. 3. Pour in the passata and stir in the breadcrumbs. Add the beaten eggs and mix well to combine. Spoon the mixture into the lined loaf tin, pressing down firmly with the back of a spoon. Cover with foil and cook in the preheated oven for 50 minutes, then remove the foil and cook for a further 10 minutes. 4. Allow the loaf to stand in the tin for 10-15 minutes, then turn out onto a chopping board. Remove the baking parchment and serve in thick slices. Great with all the usual Christmas Day vegetables and extra cranberry sauce.